--Sylvia this looks very interesting! --I really love the cover of "The Salt Covenants"! I have a thing for beaches and the model really makes an eye-catching cover. Plus the book description sounds really unique. --I love books that touch the heart. By Chapter 3, I cried about the injustice of the Inquisition period. Sylvia must have spent hours researching the data given. Excellent and spell-binding ! --Sylvia is a very talented author. Her books are ones you don't want to put down. --I totally enjoyed this book. I hated to put it down and was sorry when I reached the end. Great Job Sylvia! --This is a fantastic book. Very impressed with this author! Well written as she takes you along the journey of the Inquisition and travels to the new world. Highly recommended! --Sylvia your next book looks wonderful!!! 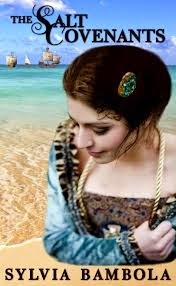 --Historical fiction is a challenge for an author to fit the characters to the time in a believable manner.. Sylvia Bambola does it! --Creative, ingenious, captivating...your books always take me With them! Looking forward to going on the Salt Covenant journey.